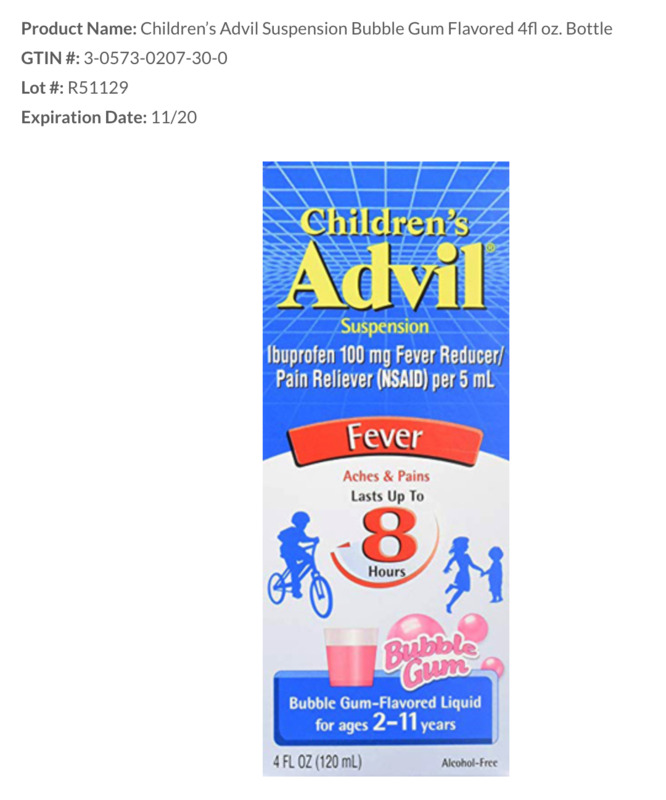 A specific lot of Children’s Advil Suspension in bubble gum flavor is being voluntarily recalled by Pfizer Consumer Healthcare due to overdose concerns. According to a press release from Pfizer, certain four-ounce bottles of the medication contain mislabeled dosage cups. The cups provided are marked in teaspoons and the dosage instructions on the label are described in milliliters. One teaspoon is equal to roughly 4.9 milliliters. "Pfizer performed a Health Hazard Assessment which concluded that the use of the impacted product has a chance of being associated with the potential overdose," the press release says. The recall information of the affected product can be seen below. Symptoms of ibuprofen overdose include: nausea, vomiting, headache, drowsiness, blurred vision and dizziness. Anyone who purchased the recalled medicine can return it to the store where it was purchased for a full refund. Consumers who have additional questions or concerns can contact Pfizer's consumer healthcare information line at 800-882-3845.